To see the StylPro live in action watch the video below. If you enjoy it please give it a thumbs up and subscribe to my YouTube channel. In this video I demonstrated how to use the StylPro Makeup Brush Cleaner in the Rainbow Gift Set which is the perfect present for the beauty obsessed babes in your life! The included booklet makes working the StylPro a cinch but if you prefer a video or step by step image tutorial you can always check it out on The Shaver Shops website. As you can see in the video I cleaned some of my dirtiest makeup brushes (yes I am ashamed of how bad they were!) and you can see the results for yourself. After connecting my brush to the StylPro, cleaning for 10 seconds and spin drying for 10 seconds the brush not only appeared clean like new but it was completely dry meaning I could use it straight away! 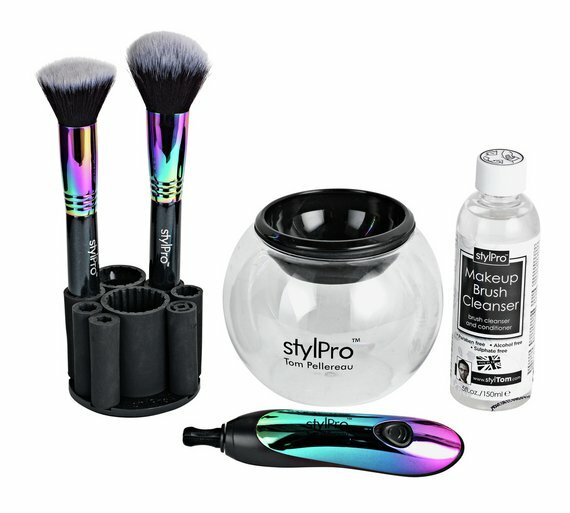 I am beyond impressed with the StylPro Makeup Brush Cleaner, in fact I wish I had thought of it myself! Not only is it great for cleaning your own personal brushes but I would use this in my studio between makeup jobs so then I had freshly cleaned and sanitised brushes waiting for my next client. The StylPro Makeup Brush Cleaner is available now from The Shaver Shop. Have you tried the StylPro Makeup Brush Cleaner before? Let me know your thoughts in the comments below.